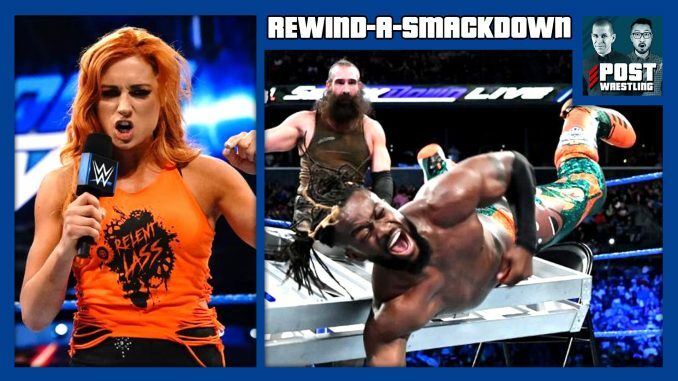 REWIND-A-SMACKDOWN 8/21/18: Becky explains, New Day vs. Bludgeon Bros.
Becky Lynch tells us why she attacked Charlotte, The New Day vs. The Bludgeon Bros. in a No DQ match for the tag team titles, Samoa Joe has more words for AJ Styles’ family, and the Miz vs. Bryan feud expands to include Maryse and Brie Bella. We discuss TODAY’S TOP STORIES including the death of Villano III, Raw ratings, Erick Rowan’s torn biceps, AAA TripleMania and the status of Matt Hardy. John reviews Joey Janela’s Lost In New York, GCW’s follow-up to Spring Break 2 featuring Matt Riddle vs. PCO, Joey Janela vs. Jinsei Shinzaki, and WHEATUS. Wai discusses Being The Elite (Ep. 116) with a must-see tribute to Beyond The Mat, a great Christopher Daniels promo and a face-to-face encounter between Marty Scurll and Kazuchika Okada. We also discuss BTE’s SCU Training for ALL IN special as Frankie Kazarian and Scorpio Sky parody Rocky III.